Use the single basic sugar cookie dough to make all four of the heart designs for this sweetheart of a cookie. Beat shortening in a large mixing bowl with an electric mixer on medium to high speed for 30 seconds. Add granulated sugar, baking powder, and salt; beat until combined, scraping sides of bowl occasionally. Beat in egg, vanilla, and peppermint extract until combined. Beat in as much flour as you can with the mixer. Stir in remaining flour with a wooden spoon. Tint and shape dough as directed for each cookie variation. Place cutouts 1 inch apart on an ungreased cookie sheet. Bake in a 375 degree F oven for 8 to 10 minutes or until golden. Transfer to wire racks and cool. Makes 30 cookies. Checkerboard Hearts and Bleeding Heart Cookies: Divide dough in half; divide one half in half again. Tint one quarter red and one quarter pink with food coloring. Wrap each portion in clear plastic wrap; freeze for 20 minutes. Divide plain potion into eight pieces. Divide each colored portion into four pieces. Roll each piece on a lightly floured surface into an 8-inch-long rope. Flatten each on four sides to form a square rope. For checkerboard design, place four ropes side by side on waxed paper, alternating colors with plain ropes. Top with four more ropes, alternating colors. Repeat two more times, forming an 8x8x2-inch dough block with a checkerboard pattern. Wrap in waxed paper and freeze 1 hour or until firm. Cut dough crosswise into 1/4-inch-thick slices. 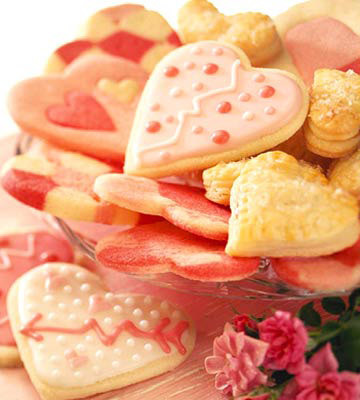 Cut a heart shape from each slice with a floured 2-inch heart-shape cookie cutter. Reserve scraps for Bleeding Heart Cookies. Bake as directed. Checkerboard Hearts and Bleeding Heart Cookies: Mix dough scraps lightly with your hands so dough looks marbled. Roll dough on a lightly floured surface until 1/4 inch thick. Cut with floured 2-inch heart-shape cookie cutter. Bake as directed. Inside-Out Cookies: Divide dough into three portions. Tint one portion pink and one portion red with food coloring. Roll dough, one color at a time, on a lightly floured surface until 1/4 inch thick. Cut with floured different size heart-shape cookie cutters. Using a smaller cookie cutter, cut hearts from the center of each cookie. Remove smaller hearts and interchange them so cookies have a contrasting colored heart in the center. Reroll dough scraps and repeat. Bake as directed. New Wave Cookies: Cover and chill dough for 2 hours or overnight. Roll dough on a lightly floured surface until 1/4 inch thick. Cut with a floured 3-inch heart-shape cookie cutter. Place cutouts about 1 inch apart on an ungreased cookie sheet. Bake as directed. Transfer to wire racks and cool. Frost with Powdered Sugar Icing. Dry on a wire rack. Combine small amounts of the remaining icing and a few drops of desired food colorings. Place each color icing in a small sealable plastic bag. Decorate cookies with colored icings. Let dry.